The Porta-Vise has been purchased and used for more uses and businesses than we could have ever imagined. Here are just a few of the uses our satisfied customers have found. Out in the fields, you can’t make a quick run back to shop when you need a vise. Service Work, Well Repairs, Installations, Drilling Maintenance – All of these jobs can utilize the strength and durability of a Porta-Vise directly on the job site. Sprinkler installations and repairs, mower and trimmer maintenance, there are a number of uses for a vise while on the job. The Porta-Vise is perfect for any times you need a vise while doing your landscaping work. Whether you work in Public Utilities or Private Utilities, your truck or van is your office and shop every day of the week. If you need a vise while doing general maintenance work out in the field, going back to shop can be a pain. 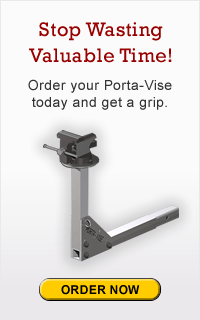 Save valuable time with the Porta-Vise. You never know what you’re going to need while on the job site. Don’t rely on a make-shift vise using what you have available. Get yourself a Porta-Vise and have the tools you need no matter where you are. Going from job site to job site, home to home, office building to office building, having a portable vise is something you shouldn’t be without. Do yourself a favor and stop stressing and wasting time with needing a vise. Get yourself a Porta-Vise and find out how much time you’ve been wasting. You probably can’t count the number of times you’ve needed a vise but didn’t have one when and where you needed it. With the Porta-Vise, you’ll always have a vise to hold whatever you need to weld in place. Take the worry out of it. It wasn’t the original intention of the Porta-Vise, but tailgaters have taken the Table Top option to new and more uses than we could have imagined. If you’re an avid tailgater, find out why the Porta-Vise with the Table Top attachment is sweeping the tailgating scene! Keep your food and drinks up off the ground and away from bugs (and clumsy dog or running kiddy feat). There’s never enough flat space when you’re camping. With the Porta-Vise, you have a nice, big flat surface which can hold a considerable amount of items when the Table Top is attached. A vise or a flat surface to place tools and parts, the Porta-Vise is an ideal work station when fixing and repairing bikes out on the trails.